Many are familiar with One A Day. This famous company produces supplements taken by both men and women for a vast array of problems. 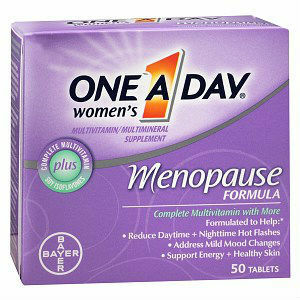 Now, One A Day provides a special formula for women in Menopause. Among the benefits of this product are increased bone, heart, skin, and breast health, increased physical energy, reduced hot flashes, and reduced mild mood changes. Because many consumers of this product have been quite satisfied, let us take a closer look at their product. One A Day recommends one tablet be taken daily with food. There is no indication of a specific time when this tablet should be consumed. One A Day can be purchased on Amazon for $14.96. It should be noted that customers can log into One A Day’s website and redeem a $2 off coupon valid for all their products at any location. Consumers can also save 5% on Amazon if they subscribe to regular deliveries. One A Day does not offer any form of a guarantee with their products. The lack of a guarantee is something customers should be concerned about as there is no safety net for void results. Although many women have had success with One A Day, there are some concerns about this product. First concerns the benefits. Although One A Day seems to promote many aspects of health, there is very little mentioned about relieving symptoms. Women in menopause desire relief from symptoms. If a product cannot relieve symptoms, other medicine will have to be taken, thus increasing the daily consumption of pills. Second concerns the ingredients. It is a concern that several ingredients in One A Day are not natural and can actually be harmful to the body. A third problem concerns no guarantee. A company should always have a guarantee for its product; this creates a safety factor for each and every customer. Jackie Horowitz	reviewed One A Day Women's	on December 15th	 and gave it a rating of 2.5.